Archipelagoes of artificial islands and reefs built around submerged subway cars are among the proposals contained in "On the Water / Palisade Bay," a master plan to protect Upper New York Bay against rising sea levels and extreme storm surges. The flooding in New York and New Jersey caused by Superstorm Sandy prompted calls from Gov. Andrew Cuomo and other officials to consider building storm surge barriers to protect Lower Manhattan from future catastrophes. 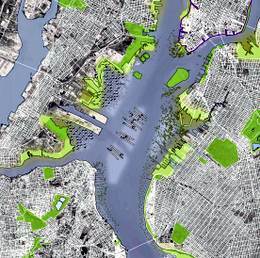 But, such a strategy could make things even worse for outlying areas that were hit hard by the hurricane, such as Staten Island, the New Jersey Shore and Long Island’s South Shore, a City College of New York landscape architecture professor warns. Professor Seavitt calls, instead, for deploying a storm defense strategy that combines elements of soft infrastructure with the hardening of existing infrastructure such as the subway system, highways and power plants. “The idea of soft infrastructure is to use techniques from nature and ecology to improve resiliency,” she explains. “Environments that are more resilient bounce back faster after storms, and greater resiliency reduces the velocity of and damage caused by the water’s surge.” Additionally, it would be much less expensive than building storm surge barriers, with costs running to hundreds of millions of dollars instead of billions. 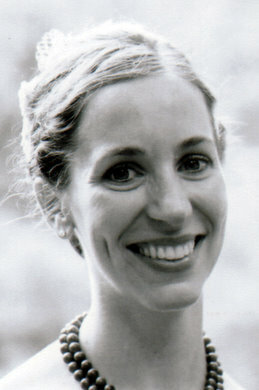 She first proposed development of soft infrastructure in “On the Water/Palisade Bay,” a report published in 2010 in collaboration with structural engineer Guy Nordenson and architect Adam Yarinsky, and funded by the Fellows of the American Institute of Architects’ biannual Latrobe Prize. Mr. Nordenson is Professor Seavitt’s husband. The team’s research focused on New York’s Upper Bay, which is bounded by Manhattan, Brooklyn, Staten Island and New Jersey. Its proposal consisted of strategies to adapt to and mitigate the effects of rising sea levels caused by climate change, including increased potential storm surges from hurricanes and nor’easters. Among the techniques it proposed were restoring and enlarging wetlands, creating reefs and archipelagoes of artificial islands and seeding oyster beds. Spoils from harbor dredging and deepening, which is regularly performed by the U.S. Army Corps of Engineers, could be used for these beneficial purposes. Reefs and wetlands would mitigate destruction by absorbing water and dissipating wave energy. Archipelagoes of small, artificial islands would weaken wave energy in the water column. Oysters and other mollusks would biologically filter and help cleanse the water in the bay. Additionally, the report called for using – and extending – old abandoned piers and extracting slips into the city to allow water to enter flood zones in a more controlled way, thus minimizing damage. Calm water areas could be established behind piers, which would serve as storm surge buffers. Water would still enter some streets, but these could be engineered as bioswales, incorporating a simple gravity flow system that would enable the waters to be absorbed, and safely and readily recede. Even if soft infrastructure strategies were implemented, some critical infrastructure would still need to be hardened, i.e. made waterproof, Professor Seavitt notes. Specifically, she recommends protecting subway entrances and sidewalk grates to prevent flooding of the public transit system, relocating or hardening waterfront power plants and moving critical communications and power infrastructure out of the basements of commercial and residential buildings. Soft infrastructure techniques can be applied, as well, to protect populated areas in the outlying coastal regions that suffered extensive storm damage such as Long Island, Staten Island and the Jersey Shore. Offshore reefs and barrier islands could be created to protect shorelines and inhabited barrier islands. Many of these areas are shallower than the Upper Bay so it may be easier to work in them, she says. One technology that could play a role in this process is a recent Dutch invention known as a sand motor, in which enormous quantities of sand are deposited offshore. Waves, currents and tides distribute it in a natural way, creating a protective barrier island. Currently, Professor Seavitt is working with Guy Nordenson & Associates and the Port Authority of New York and New Jersey on a pilot project to create an artificial island at the Gowanus Flats, a shallow section of Upper Bay off Brooklyn’s Sunset Harbor waterfront. 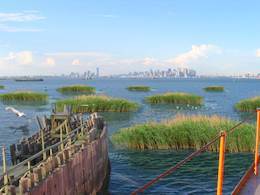 She also notes that efforts are underway to create new oyster reefs around Governors Island as well as wetland restoration through the reuse of dredged sediment in Jamaica Bay.